Thank you for this post! I lived in the first horseshoe in 1996-7 (oops! ), after all of the rooms had been converted to singles, while they were all still "specialty" dorms (language houses, 9-month housing for working students, LGBT support etc.) I'm sad to hear that they are not inhabited anymore! Thanks, Jessica! 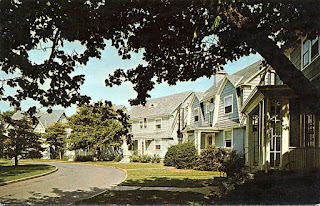 I lived in the first horseshoe, too, when just a few of the houses were special-interest housing. It would be really wonderful if students could once again have the experience of living there. I lived in the first horseshoe, too! I lived in Corwin C when I was a freshman in 1986. I loved it! Truly a shame the dorms are not in use anymore. Thank you for sharing this history! One of the reasons I chose to go to Douglass was because of the special interest housing in Corwin. I lived in the Global Village's "La Casa Hispanica" or Spanish House and was heartbroken when I found out future generations would not have the same experience. I have the best memories of living in Corwin and wish that they would renovate all the homes and offer the same residential learning community that I fell in love with to incoming students. 1972-77. The two horseshoes at Corwin had excellent tennis courts. With he tall trees around them, and the houses gave it all an elegant air. Yes, people had intense pride in their houses. What a shame Rutgers did not continue maintaining them as residences. What are the building being used for now? Thanks for sharing this info. It's sad for those of us who loved living at Corwin, but hopefully this new use will bring great experiences and memories for the students living and studying there. I am a current Douglass woman and the houses remain abandoned. However, for those who are concerned-- the Global Village houses still exist but they are housed on different floors throughout Jameson. So la casa hispanica as well as many others are still a big part of Douglass! Thanks for the update! Have you heard anything about the plans to tear down the remaining Corwin houses to make room for a new building for students with autism?